Green and great! Produced on the Northern Coast of California, Green Truck organic chardonnay has a balance of fruit and oak that make it a fine wine for any occasion! 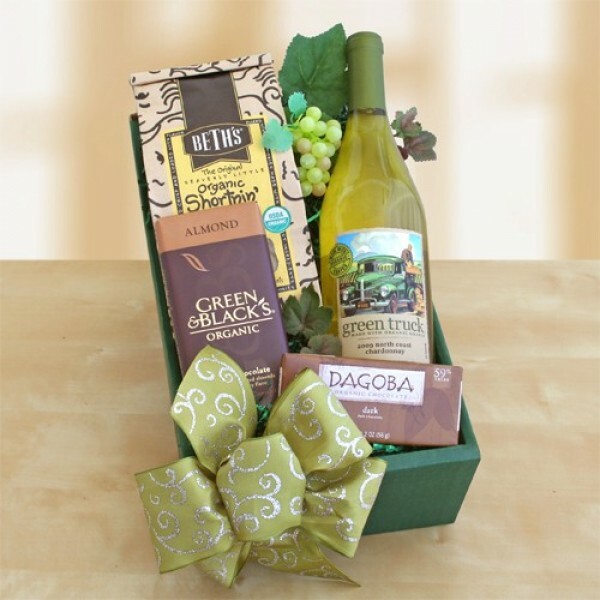 Continuing the organic theme, we have included Dagoba dark organic chocolate, Beth’s organic shortbread cookies, and a Green and Black's chocolate bar. All are packaged in a forest green box and tied with an elegant green bow. Cheers! You can't always find organic wine so this was nice. The snacks were fresh.